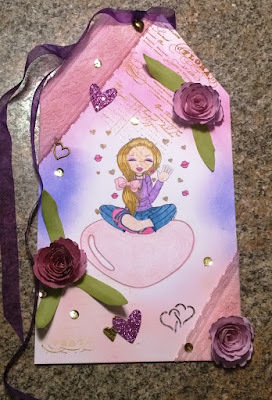 All My Love Crafts: Tag You're It! Unfortunately this will be my last post for Creative Craft Cottage. The restaurant business has taken a lot of my time and I need to put my card-making on hold. (for now anyway!) My posts will be less often and perhaps only seasonally, such as the quarterly Coffee Lovers Blog hop each season. Cute As A Button and Robyn's Fetish Digital Stamps! 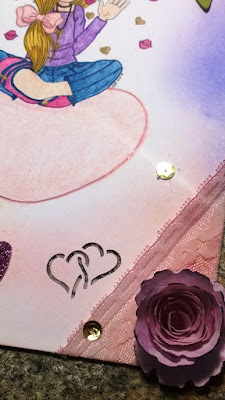 I used this darling image called Valentine Kisses by Cute As A Button! She was colored in my favorite medium, of course, Prismacolor Pencils. 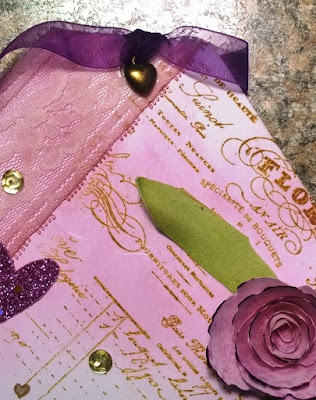 I used Distress Inks in Seedless Preserves, Lilac and Spun Sugar for the soft background effect. 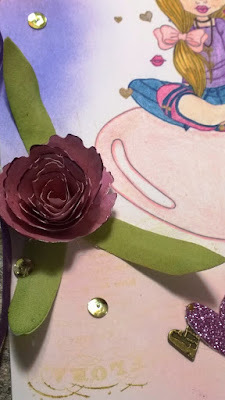 The roses were created from scrap lavender card stock and edged with Seedless Preserves Ink. The leaves were from some flowers found at Hobby Lobby. I used Saddle Brown Staz On Ink to stamp some vintage lettering onto the background at the top of the tag....and accidentally stamped the corner onto her face!! (big oops) Hoping it's not terribly noticeable as I put a lot of work into this image and didn't want to start over again. Finished this tag using some tea-dyed lace, gold sequins, small glitter hearts and little brass heart charms. I hope this creation helped inspire you to create your own tag and link it up for a chance to win digital images!